After spending a few days at home this past weekend, I came back to Brooklyn with a horrifically empty fridge. Fairly efficient with my grocery shopping, I made sure to use up every last bit of produce before leaving, as not to waste. A quick trip to Trader Joes to re-stock, I settled upon a quick chicken dinner that was both healthy and satisfying. After a few days of eating out at restaurants for pretty much every meal, it always feels good to cook up a nice meal. 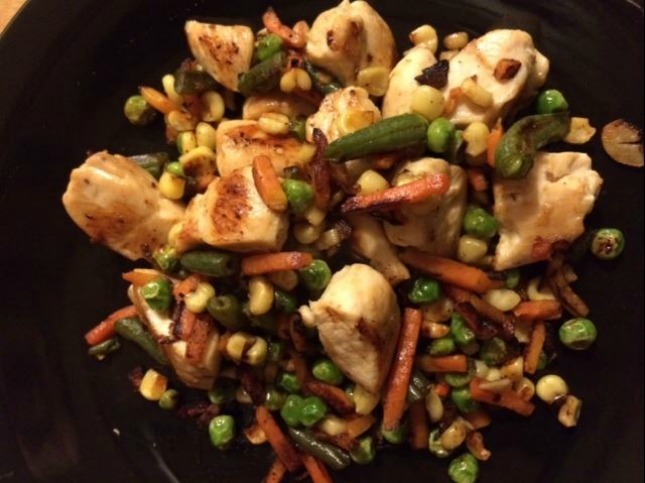 Chicken breast (I used 3 small “chicken finger” cut pieces), fresh garlic, olive oil, a bit of butter, salt and pepper and a selection of your favorite chopped veggies — I used the last of my frozen vegetables consisting of carrots, corn, peas and green beans. To start, heat up some olive oil in a pan on the stove, chop up a clove of fresh garlic and toss it in to simmer for a minute or two. This is when my kitchen starts to smell delicious. Next, slice your chicken into small and even pieces (so they will cook through at the same time). If you’d like, you can always marinade for a fuller taste — lemon pepper garlic or honey and brown sugar are some of my favorites. But I went easy on this one and just sprinkled with a bit of salt and pepper. Keep the pieces on the pan for a few minutes, until they are cooked more than 50% through. Then flip over individually to cook the other half. The garlic will infuse into the meat, which is so good. 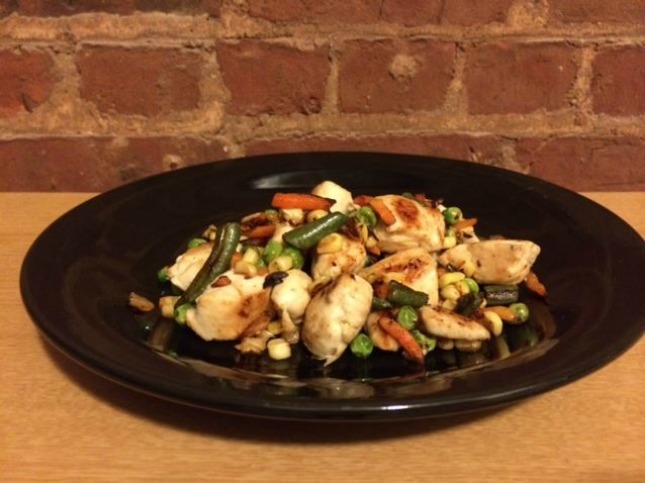 When the chicken is just about cooked, toss in your chopped veggies and a bit of butter to brown them up. I wanted them a little burnt for taste (almost like adding grill marks) — grilled vegetables are at the top of my list. Plate and enjoy. 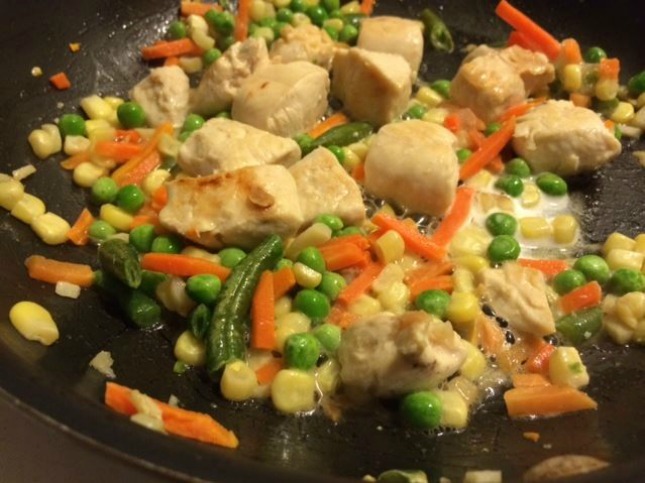 The chopped veggies make for a great substitute for rice or pasta and a dash of hot sauce over the dish will kick it up a notch. 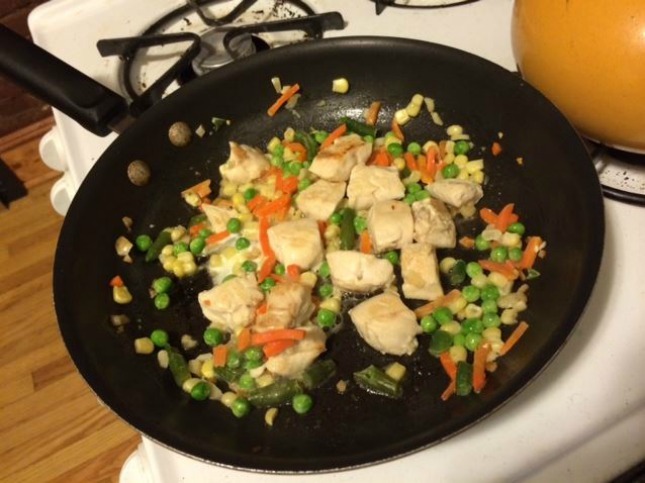 Tags: CHICKEN, garlic, healthy, olive oil, recipes, ROOKIE CHEF, saute, veggies. Bookmark the permalink.